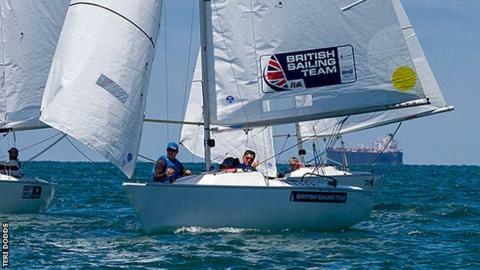 Great Britain's Sonar crew won their third world title with victory at the Para World Sailing Championships in Melbourne, Australia. John Robertson, Hannah Stodel and Steve Thomas beat their Australian rivals by a single point. It adds to the silver won by Skud duo Alexandra Rickham and Niki Birrell on Wednesday. "We've missed out a few times over the last few years so this year's been a lot of hard work," said Robertson. The Great Britain crew, who are three-time Paralympians, won World golds in 2005 and 2006. But they faced an anxious wait for confirmation of their third success, as the Australians unsuccessfully sought to overturn a jury decision from earlier in the week. The trio must now wait to see whether they have secured selection for next year's Rio Paralympics. "We sat down and said we wanted to win a gold medal at the Worlds and we've delivered on that," said Thomas. "Selection is still in the balance but hopefully we've done enough for that, and we're a strong unit. "We're getting stronger and stronger, which is going to put us in good stead for Rio." Elsewhere, Paralympic champion Helena Lucas, who has already been selected for Rio, missed out on a medal in the 2.4mR event as she finished fourth overall, one place ahead of team-mate Megan Pascoe.